On January 22, 2019, Ambassador Liu Xiaoming held talks with Allister Heath, Editior of The Sunday Telegraph, Ian MacGregor, Editor Emeritus of Telegraph Media Group, Jane Bruton and Lucy Denyer, Deputy Editor of Lifestyle and Deputy Comment Editor of The Daily Telegraph at the Chinese Embassy and gave an interview. Ambassador Liu noted that The Daily Telegraph and The Sunday Telegraph of Telegraph Media Group are mainstream newspapers with global influence. In recent years, the two newspapers have increased their coverage on China-related stories, playing a positive role in enhancing the mutual understanding between China and western countries. The year 2019 marks the 70th anniversary of the founding of the People’s Republic of China. 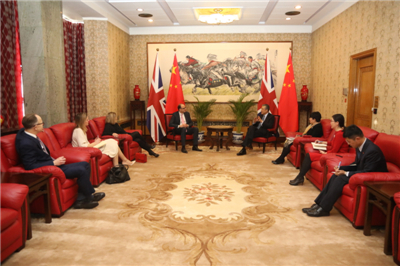 The Ambassador hoped that the two newspapers would continue to report on China in a comprehensive and objective way, so as to show a real picture of a developing China to the UK and the world. Heath said that The Daily Telegraph and The Sunday Telegraph attach great importance to China-related reports and stay committed to covering China’s development comprehensively to contribute to the understanding and cooperation between China and the UK. 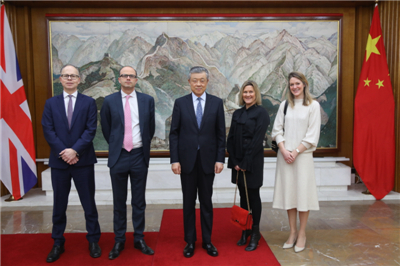 The Ambassador also gave an interview on China’s economy, China’s investment in the UK, Huawei, China-UK cooperation on nuclear energy and technology, China-US trade negotiation and North Korea nuclear issue.